LOS ANGELES — Some 500 Los Angeles janitors are standing up to the nation’s giant aerospace corporations here. Boeing, Raytheon and Northrop Grumman corporations, the multibillion-dollar aerospace/military contractors, are pinching pennies when it comes to paying their L.A. janitors a living wage and decent health care benefits. 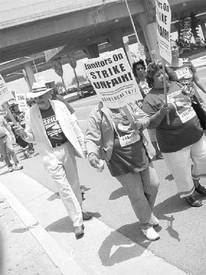 But the janitors who clean these corporations’ facilities in El Segundo, almost adjacent to Los Angeles International Airport (LAX), walked out on strike July 7 and are firm in their determination to win health care and pay they can live on. They are represented by Service Employees International Union Local 1877. The International Brotherhood of Electrical Workers and the Teamsters are honoring the janitors’ picket lines. The workers currently earn $1,000 per month, an average of $7.25 an hour, and get no health benefits. They are demanding significant wage and benefit increases, and seek a contract more in line with other unionized janitors in greater Los Angeles, who make $2 to $4 dollars more an hour with full family health benefits, says Local 1877. Boeing’s new CEO James McNerney has a pay package valued at $53 million. The three aerospace mega-corporations outsource their janitorial work to Servicon, Somers Building Maintenance, and Aramark. Local 1877 has contracts with all three of these large maintenance firms in other corporations’ buildings throughout greater Los Angeles. On July 13, two weeks into the strike, some 700 people — strikers joined by and labor, clergy and community supporters — marched through the aerospace companies’ massive corporate complex near LAX, demanding justice for the janitors. Sixteen strikers and supporters sat down in front of the complex in civil disobedience to show their determination and were arrested. Among the group were men and women in T-shirts and jackets bearing union and community emblems: UFCW, UNITE HERE, IBEW, ILWU, PACE, AFSCME, SEIU 1000, SEIU 660, Teamsters, SCLC, MAPA, ACORN and Hermandad Mexicana. At a July 15 rally in El Segundo, state Senate Majority Leader Gloria Romero told the crowd that the aerospace giants must be held responsible for raising the living standards of the janitors who work there. “They outsource the jobs. But they cannot run from their responsibility to be a good major employer in California,” Romero said to the cheering janitors. Following the rally, Romero and other state Senate and Assembly members paid a visit to Boeing and Raytheon headquarters, asking their executives to get the janitorial companies to agree to pay a living wage and benefits. A similar request was faxed to Northrop Grumman. Boeing, Raytheon and Northrop Grumman management have backed the contractors’ hard-line stand. They have been calling the cleaning companies’ negotiators and saying, “Atta boy!” in support of their stonewalling approach, Local 1877 spokesperson Lisa Gallegos said.